American Maple is a hard, non-durable timber often used for flooring and furniture making. It takes staining well and while sometimes hard to nail or screw, can be glued fairly easily. Acer saccharum, produces rock maple, hard maple or sugar maple. Acer nigrum, produces black maple, rock or hard maple. Acer saccharunum, produces soft maple r silver maple. Acer rubrum, produces soft maple or red maple. Acer macrophyllum, produces Pacific maple or Oregon maple. Acer saccharum and Acer nigrum grow to a height of 27m or more and a diameter of 0.5m to 0.75m. Acer saccharinum is of similar height but it is often of slightly larger diameter, about 1.0m. Acer rubrum reaches a height of 15m to 23m and a diameter of 0.75m. Acer macrophyllum is a smaller tree, some 12m to 24m high and a diameter of 0.5m. All types dry without undue difficulty, but rather slowly, particularly rock maple. Compared with European beech, rock maple is about equal in bending strength and in compression along the grain, and some 15 to 20 per cent superior in hardness, resistance to shock loads and resistance to splitting. Soft maple is inferior to rock maple in all strength categories ; it is 40 to 50 per cent softer, about the same amount less resistant to shock loading and in shear strength, 20 per cent less stiff, and 20 to 30 per cent weaker in bending and compression along the grain, and less resistant to splitting. Hard maple is rather difficult to work, the timber tending to cause saws to vibrate, and for cutters to ride on the wood during planning. A reduction of cutting angle to 20 degrees assists the finishing operation particularly when curly grain is present. The timer can be stained, polished and glued satisfactorily, but it is hard to nail or screw, although these are held firmly. Soft maple works and machines with less difficulty in all operations. The uses for hard and soft maple are practically the same except for most exacting requirements of hardness and strength. 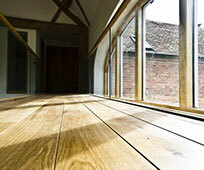 Hard maple is generally preferred for flooring and for show lasts, but soft maple is also used. Typical uses for maple include flooring, furniture, piano actions, turnery, musical instruments, sports goods, butcher blocks, bowling alleys, dairy and laundry equipment, panelling, veneer and plywood. Figured forms of maple include bird’s eye, fiddle-back, blister and curly maple.